3D Laser Scanning NY | Rampa Land Surveying P.C. The days when surveys were completed using lengthy, outdated methods for surveying are long gone. Contemporary laser scanning technology allows us to gather data regarding your site’s layout, elevation and related information. Presented in a format that is useful for developers, architects, engineers and related construction professionals, we offer high-grade laser scans that are cost-effective and relevant. Our services are available across New York City, NY, including Manhattan, Brooklyn, Queens, Staten Island and the Bronx, NY. Our surveys are suitable for both residential and commercial developments, including refurbishments, new build and redevelopment projects. To find out more about the benefits of using us for your surveying information, or to schedule a survey, call us at (718) 925-3680. The evolution of technology has now enabled us to perform what was once complex and time-consuming tasks with speed and efficiency. When it comes to construction, restoration, and surveying, it is the finer details that are most important. At RAMPA Land Surveying P.C. we offer the very best in high quality, detail oriented scanning to ensure that you have control over every aspect of your project. We help construction professionals across New York City, including Manhattan, Brooklyn, Queens, The Bronx and Staten Island, NY. How Do I Find the Highest Quality Laser Scanner Around Me? With over ten years of experience in understanding the need for high-resolution scanning services across NYC, we work hard to achieve the most accurate results every time. At RAMPA, we utilize the FARO FocusM 70 scanner which allows for quick capture of small regions to produce highly detailed scans with the least amount of resources. 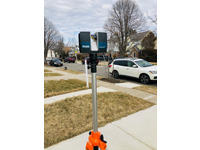 We are a fully qualified and licensed 3D laser scanning company operating throughout New York City, committed to providing our clients with the most accurate scans to assist them in their construction project. No matter what kind of project you are taking on, our laser scanning services will assist you in developing accurate, detailed plans so that you can work with confidence. We are able to assist with projects that require attention to detail, such as determining highly detailed measurements, historical preservation activities such as the reconstruction of building facades and checking the progress of your construction. Our technology also enables the production of digital 3D photographs and the surveying of out of the reach places. There is no need to go into a project without knowing every single small detail. When you trust RAMPA to take care of your 3D laser scanning needs, you are ensuring reliability, versatility, and flexibility. Give us a call at (718) 925-3680 to find out how we can help you today.